If there is one thing that we love at We Love DC, aside from DC itself, it’s cute baby animals. 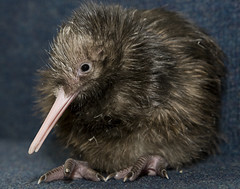 This little baby kiwi bird was hatched at the zoo on Tuesday. Isn’t it totally adorable? I know that I’m having a really difficult day here thanks to some jerks at Comcast, and this baby bird made me go awwwww just a little bit. Better yet? there’s video of it pecking out through its shell.